EVERGLADES NATIONAL PARK, Florida, December 4, 2013 (ENS) – Ten pilot whales are dead after 51 of the small whales became trapped and several beached themselves in a remote section of Florida’s Everglades National Park reachable only by boat. Fishermen noticed the beached whales around 2:30 pm Tuesday near Highland Beach in Monroe County on the park’s west coast, according to park spokesperson Linda Friar. When a team of park rangers and workers from the National Oceanic and Atmospheric Administration, NOAA, arrive on the scene Wednesday morning, they found 10 beached whales and the others in nearby shallow waters. Because four of the whales were found in “poor condition,” they were euthanized by sedation as a humane option, said Blair Mase, a marine mammal stranding specialist with NOAA. Today rescuers used five boats to block the whales from the beach while encouraging them to swim back to the Gulf of Mexico. But Mase said she doubts that any of the 41 pilot whales still alive will survive the stranding incident. The west coast of the Everglades where the whales are trapped is full of sand flats and sandbars that remain above the water level even at high tide. The water is very shallow at low tide, making it difficult for the whales to swim away. A total of 25 people are involved in rescue efforts, including officials from NOAA, the Marine Mammal Conservatory and the Marine Animal Rescue Society, Mase said. At the end of the day, local time, several of the pilot whales had started to move away from the beach. Rescue efforts will resume on Thursday morning. Officials are performing necropsies on the dead animals in an attempt to find out why this pod of pilot whales stranded en masse so far from their deep water habitat. 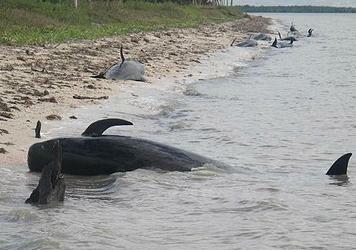 Mass strandings by pilot whales have occurred in Florida before. In 2012, nearly two dozen pilot whales stranded and beached themselves. In 2011, 23 pilot whales did the same. Short-finned pilot whales are found in warm temperate to tropical waters of the world, generally in deep offshore areas. They are not endangered, and research conducted in 2004 found at least 2,388 animals in the Gulf of Mexico. The IUCN Red List classifies the species as Data Deficient, population trend unknown. mammals and identify and view marine mammals responsibly in the wild. Dolphin & Whale 911 enables users to report stranded dolphins, whales, and seals in the southeastern United States: Alabama, Georgia, Florida, Louisiana, Mississippi, South Carolina, North Carolina, Texas, Puerto Rico and the U.S. Virgin Islands. Reports of live or dead stranded, injured or entangled marine mammals will immediately go to trained and authorized emergency responders from the Southeast U.S. Marine Mammal Stranding Network. The public may also send GPS stamped photos of the animals to the stranding network in real time. Marine Mammal Branch Chief for NOAA Fisheries. “This technology will make it easier for people to know who to call and what to do if they find a stranded marine mammal. Marine mammal strandings in NOAA’s Southeast Region average about 730 animals each year. WASHINGTON, DC, December 4, 2013 (ENS) – Four environmental groups petitioned the Obama Administration Tuesday to exert more control over the federal agency known as Wildlife Services. This agency kills nearly 1.5 million coyotes, bears, otters, foxes, birds and other animals each year with no requirement to disclose its activities to the public. Lead petitioners include Center for Biological Diversity, Project Coyote and the Animal Welfare Institute. The Animal Legal Defense Fund signed on as a supporting petitioner. The petition was filed with the U.S. Department of Agriculture, which oversees Wildlife Services. “The secretive killing, which includes aerial gunning, traps and exploding poison caps, has gone on for decades with little public oversight or rules requiring the use of the best available science or techniques to reduce the deaths of nontarget animals,” says the Center for Biological Diversity. “Wildlife Services is an out-of-control, rogue agency that shoots, snares and poisons more than a million native animals every year, many unintentionally – including at least 13 endangered species,” said Amy Atwood, a senior attorney at the Center for Biological Diversity and the primary author of the petition. “Despite calls for reform by members of Congress, scientists and the public, Wildlife Services is still operating without the kind of legally binding regulations that ensure transparency and accountability to the taxpaying American public, creating a free-for-all that should have been ended decades ago,” Atwood said. The petition calls for the agency to develop regulations to ensure use of the best science when determining whether action should be taken against animals. It asks that the agency avoid killing nontarget animals, including endangered species, and ensure ethical treatment of targeted animals and exhaustion of nonlethal means of resolving situations before killing animals. Finally, the petition requests the release of reliable information to the public about the animals the agency kills. A response to the petition is required by law; any decision is subject to review by the courts, Atwood said. The agency has released data showing that it kills an average of nearly 4,000 nontarget native animals annually, including at least 13 endangered species, such as Louisiana black bears, Mexican gray wolves, wood storks, Hawaiian stilts, island foxes and roseate terns. Under various names, Wildlife Services has killed millions of animals since the early part of the 20th century, targeting native carnivores like coyotes and foxes, prairie dogs, birds and many other species at the behest of agribusiness interests. The agency contributed to the decline of gray wolves, Mexican wolves, black-footed ferrets, prairie dogs, and other species during the first half of the 1900s, and continues to impede their recovery today, say the petitioning groups. The past five years have been some of the most active for the agency, with more than 1.5 million native animals killed per year. According to the agency’s own figures, quoted by the petitioners, since 1996 more than 22 million native animals of 476 different species have died at the hands of the agency. WASHINGTON, DC, December 4, 2013 (ENS) – Two U.S. Forest Service drones may now take to the skies after sitting in a hanger since 2007, according to agency documents posted Tuesday by Public Employees for Environmental Responsibility, PEER, a national group of employees who work for natural resources agencies. After years of being grounded in a law enforcement program, the drones are being transferred to the Forest Service’s fire-fighting wing. But PEER objects that the drones will be guided by an internal group which will not meet publicly and lacks a mandate to consider privacy concerns or other external issues. In 2007, the Forest Service law enforcement program bought two pilotless aircraft for photo reconnaissance. Despite spending $100,000 to purchase them, the two “Sky Seers” never saw a day of service as the law enforcement program lacked both trained pilots and Federal Aviation Administration clearance to operate, according to documents obtained by PEER under the Freedom of Information Act. In a late 2010 briefing, the Forest Service law enforcement leadership informed the Chief Forester that it was giving up on its plans to use its drones to combat marijuana cultivation in California forests and would transfer them to the agency’s Fire and Aviation program. “These documents make the Keystone Kops look like a crack operation compared to the Forest Service law enforcement leadership,” said PEER Executive Director Jeff Ruch. He observed that the law enforcement program said it was “not aware of any legal or privacy constraints that would preclude the use” of a drone and thus did no review of the issue. “It was especially galling to understaffed law enforcement field staff that their leadership was buying fancy hardware it had no conception of how to use,” Ruch said. In September 2012, the Forest Service Fire and Aviation Management adopted a formal charter for “Unmanned Aircraft Systems” establishing a special advisory committee to develop a “strategic plan” for drone use, to create protocols and guidance for their operation and to perform “risk assessment” of any proposed operations. The 14-member group was given three years to accomplish 10 listed tasks to facilitate drone deployment. This steering committee is internal to the Forest Service and is not required to hold public meetings. Privacy protection for forest visitors is not among its assigned tasks. The Forest Service’s fire program has been “tinkering with pilotless aircraft since 2005 when it spent $10,560 on a Cyber Bug drone to begin developing command and control capacity in fast-moving fires,” Ruch said. But the Federal Aviation Administration is still formulating rules to open unrestricted airspace to commercial and institutional drone traffic. WASHINGTON, DC, December 4, 2013 (ENS) – NASA is committed to Mars exploration and “ground-breaking science missions” to asteroids, the Moon, and other locations in the solar system, even in the face of restructuring to deal with financial constraints, said NASA’s Planetary Director Jim Green. “NASA’s commitment to planetary exploration research and analysis activities will remain strong with no lessening of our resolve to continue to lead the world in this area while reflecting fiscal realities,” Green told a virtual town hall meeting with the planetary scientific community on Tuesday. During the afternoon call, Green outlined NASA’s proposed restructuring plans to consolidate some of the supporting research and technology activities to ensure a balanced planetary science portfolio for the next decade. Research scientists expressed disappointment that Solar System Workings, a new category covering about half of existing grants, will not accept research grant proposals next year. Researchers who planned on submitting proposals throughout 2014 will have to wait until NASA coffers fill up again. In addition to last month’s launch of a mission to the study the upper atmosphere of Mars, NASA currently operates two rovers on the Martian surface. Green said the agency is planning to launch a Mars lander and another rover in the coming years. WASHINGTON, DC, December 4, 2013 (ENS) – The U. S. Department of Agriculture and the Environmental Protection Agency are expanding their joint efforts to support water quality trading and other market-based approaches to water pollution. “EPA is committed to finding collaborative solutions that protect and restore our nation’s waterways and the health of the communities that depend on them,” said EPA Administrator Gina McCarthy. Water quality trading can mean “a better bottom line for farmers and ranchers,” she said. Water quality trading allows regulated entities to purchase and use pollutant reduction credits generated by other sources in a watershed to comply with EPA Clean Water Act requirements. They can use the credits to meet their water quality-based effluent limits in National Pollutant Discharge Elimination System permits. Cost savings and other economic incentives are the key motivators for parties engaged in trading. Water quality trading also can provide air quality improvements, enhanced wildlife habitat, carbon capture and storage, and new income and employment opportunities for rural America, said Vilsack and McCarthy. Under the plan announced Tuesday, both agencies will identify and share information and opportunities to help improve water quality trading programs across the country. They will coordinate and enhance communications and outreach to states, agricultural producers, regulated sources, and interested third parties on water quality trading. They will review grants, loans or technical assistance programs focused on water quality trading and will share information on the development of rules and guidance governing water quality trading. Vilsack and McCarthy said their agencies will collaborate on developing tools and information resources for states and credit generators to guide decision making, reduce costs in program design and implementation, improve environmental performance, and foster consistency and integrity across regional initiatives. They will co-host a workshop by 2015 to share tools and resources available to assist in stakeholder decision making and opportunities. The 2013 Atlantic hurricane season, which officially ended on Saturday, November 30, had the fewest number of hurricanes since 1982, thanks in large part to persistent, unfavorable atmospheric conditions over the Gulf of Mexico, Caribbean Sea, and tropical Atlantic Ocean. “A combination of conditions acted to offset several climate patterns that historically have produced active hurricane seasons,” said Gerry Bell, PhD, lead seasonal hurricane forecaster at NOAA’s Climate Prediction Center, a division of the National Weather Service. “As a result, we did not see the large numbers of hurricanes that typically accompany these climate patterns,” said Bell. This year is expected to rank as the sixth-least-active Atlantic hurricane season since 1950, in terms of the collective strength and duration of named storms and hurricanes. Thirteen named storms formed in the Atlantic basin this year. Two, Ingrid and Humberto, became hurricanes, but neither became major hurricanes. Major hurricanes are categories 3 and above with winds blowing harder than 111 miles per hour. Although the number of named storms was above the average of 12, the numbers of hurricanes and major hurricanes were well below their averages of six and three, respectively. Tropical storm Andrea, the first of the season, was the only named storm to make landfall in the United States this year. Andrea brought tornadoes, heavy rain, and minor flooding to portions of Florida, eastern Georgia and eastern South Carolina, causing one fatality. The 2013 hurricane season was only the third below-normal season in the last 19 years, since 1995, when the current high-activity era for Atlantic hurricanes began. “This unexpectedly low activity is linked to an unpredictable atmospheric pattern that prevented the growth of storms by producing exceptionally dry, sinking air and strong vertical wind shear in much of the main hurricane formation region, which spans the tropical Atlantic Ocean and Caribbean Sea,” said Bell. Several outbreaks of dry and stable air that originated over Africa provided unfavorable conditions for hurricane formation, Bell said. While the United States was spared this year, Mexico was battered by eight storms, including three from the Atlantic basin and five from the eastern North Pacific. NOAA and the U.S. Air Force Reserve flew 45 hurricane hunter aircraft reconnaissance missions over the Atlantic basin this season, totaling 435 hours – the fewest number of flight hours since at least 1966. NOAA will issue its next Atlantic Hurricane Outlook in late May 2014, before the start of the hurricane season on June 1.